Lisnagarvey continued on their winning ways with a tenth straight victory in the Irish Hockey League as they beat Three Rock Rovers 4-3 in Dublin. The Ulster side increased their lead at the top of the table to nine points over Monkstown, who drew 1-1 at third place Banbridge. Cookstown moved of the bottom after a 2-1 win over Annadale. 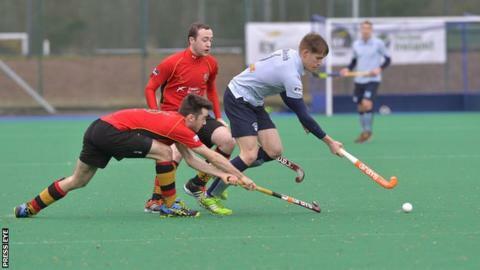 Hermes also secured a place in the play-off finals and next season's European Champions trophy. Pegasus and Ulster Elks kept up their respective challenges for the play-off finals with wins on Saturday. In a dress rehearsal for next Saturday's Irish Senior Cup semi-final, Lisnagarvey were pushed all the way by Three Rock Rovers despite taking a 3-0 lead. Goals from Paul Gleghorne, Neal Glassey and Paul Ritchie looked to have set Garvey on route to a comfortable victory before Rovers pegged them back to 3-2. Timmy Cockram eased any nerves despite a late goal for the home side. Irish international coach Craig Fulton was at Havelock Park to watch a number of his squad battle each other as Banbridge and Monkstown fought out a 1-1 draw. Both goals came at the end of the third quarter as Eugene Magee hammered home a rebound after his original strike from a penalty corner had been saved. Moments later the visitors were awarded a penalty stroke that Gareth Watkins converted to leave neither side happy with the result but both still in the play-off positions. Goals from Mark Crooks and Jon Ames were enough for Cookstown to win their bottom of the table Ulster derby with Annadale. The two sides will meet against next Saturday in a rearranged league fixture but this win moved Cookstown three points ahead of their Ulster rivals and they are only three points behind Cork C of I who continue to slip down the table after a 2-1 loss to Railway Union. Pembroke Wanderers were 3-2 winners at Glenanne. In the women's IHL Hermes were crowned league champions after they beat bottom side Greenfields 9-0 and UCD lost 3-1 at Ulster Elks. The Dublin side have dominated the All Ireland season with 13 wins and a draw and in Galway internationals Chloe Watkins and Nikki Evans each scored twice in an easy win. The battle for the two remaining play-off final places continues to heat up. The Elks moved up to fifth place in the table as they won the dress rehearsal for the Irish Cup semi-final against UCD next Saturday. Megan Frazer gave them the lead with an early penalty stroke but Elaine Carey equalised in the third quarter. It was a superb solo effort from Dawn Axon that edged the Elks back in front when she beat three players and planted a backhand shot high into the net. Robyn Chambers made it 3-1 and that's how it stayed with a scoreless final 15 minutes. The Jordanstown based side are now three points behind second place Pegasus, who moved above UCD and Railway Union following a 3-1 home success over Cork Harlequins. A foul in the circle on Vanessa Surgenor in just the second minute allowed Steph Thompson to score the penalty stroke but the visitors equalised four minutes into the second half through Yvonne O'Byrne. Almost immediately Surgenor fired home from a penalty corner and Alex Speers rounded off the scoring, converting a pass from Tate Doherty. UCC were 1-nil winners at Pembroke.